NYC is Blue: Wall Street Journal: "At Long Last"
The fans of New York City FC, the soccer team that has never played a game, were under attack. As they took their seats at January's MLS SuperDraft, the abuse came from all sides. There were chants of "De-rek Je-ter" and a rendition of "Take Me Out to the Ball Game," to make light of NYCFC's rented home at Yankee Stadium. The purple-clad fans of Orlando City SC, Major League Soccer's other new expansion franchise, bombarded them with "Where's Frank Lam-pard," referencing the star midfielder who will be noticeably and controversially absent for the first months of NYCFC's season. More taunts rained down: "Who are you?," and "Man City two," maligning NYCFC's perceived status as a farm team for sister club Manchester City, one of the juggernauts of English soccer. Through it all, Chance Michaels tried to keep his troops in line. "Calm down, calm down," cautioned Michaels, the president of the NYCFC supporters group known as the Third Rail, appealing to the few dozen members who had made the trip to Philadelphia for the event. "This comes with the territory." When you're the new kid on the block, you're bound to take abuse. It comes double when you arrive on the scene with outsize fanfare, backed by big money and interests, bringing in (and losing) star players, and fending off controversy before a game has ever been played. "Since we started, we've endured our slings and arrows, and people have said, 'How can you be fans of a team that isn't a team?'" Michaels said. "We took our lumps." That's why Michaels and his cohort are looking forward to Sunday, when NYCFC will travel to play its inaugural match against Orlando City SC. Orlando's 60,000 seat Citrus Bowl is sold out for the match, and among that crowd will be a sizable New York contingent. That's just what the heads of NYCFC hoped would happen when they began their campaign to get this fledgling soccer team on the map and create a devoted fan base from thin air. Dropping a sports team into a market where no fewer than nine professional franchises already fight over public attention doesn't exactly come with a road map, said the team's outgoing chief business officer, Tim Pernetti. "I'm not sure that's happened recently, nor will it probably happen again," Pernetti said. "The biggest challenge you have, especially in New York, is that you're bringing a new pro sports franchise to the most chaotic and distracted market in the country, and it's also the most diverse market in the country. To cut through and really be identifiable, you have to be creative, take advantage of the right relationships. And you have to pick your spots." With the home opener slated for March 15, NYCFC has sold more than 14,000 season tickets for a stadium configuration normally expected to seat just under 28,000. The average attendance for an MLS game hovers around 19,000. "People are far more aware of this club than I think people expected fans to be," Pernetti said. NYCFC is the well-heeled offspring of City Football Group, the owners of the Manchester City team, and the New York Yankees, and it will play home games at Yankee Stadium until a soccer-specific stadium is built somewhere in the five boroughs. 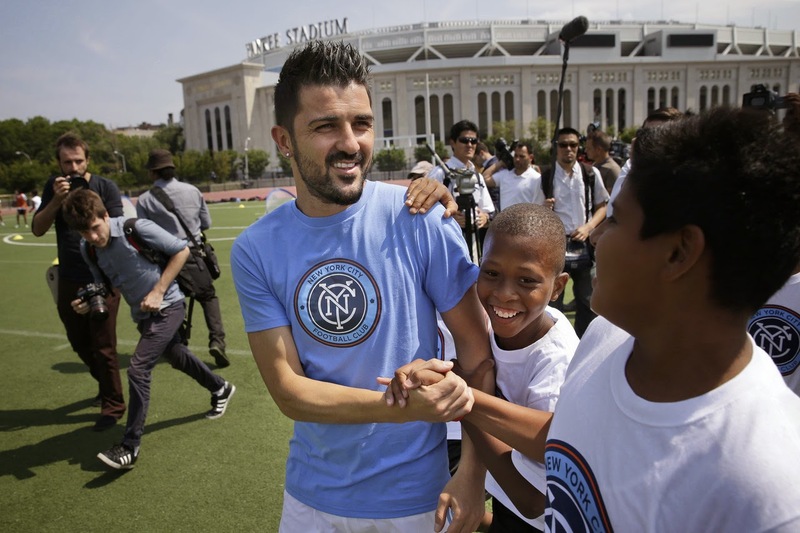 To plant and grow a fan base, NYCFC targeted several core constituencies. First, it went after the city's existing but underserved soccer fans, who might already follow soccer on the international level but want a closer relationship with the local game. These aren't just rabid all-around sports fans. Tom Glick, the incoming president of NYCFC, said that more than 60% of the club's season-ticket holders have never held a season ticket with any other New York team. "These in many cases are young professionals, 25 to 35," Glick said. "There's a niche of passionate soccer fans in New York that has been underserved. It's our good fortune to be able to fill that void." Also ripe for possible poaching are fans who were already watching a New York-area MLS team: the New York Red Bulls. In its advertising and branding efforts, NYCFC has portrayed itself as the team of the five boroughs, a not-so-subtle invitation to any New York City-residing Red Bulls fans to come on over to Yankee Stadium. NYCFC executives have repeatedly stated that the rising tide will lift all boats when it comes to New York soccer, and that any rivalry will be good for both teams. "Certainly, the New York metro area is big enough for two teams to do well, and I think one will really help the other," Glick said. Michael Warchol, a board member for Viking Army, one of the chief Red Bulls supporter clubs, said his group has already witnessed members quietly defecting, particularly from the ranks of New York City residents, though it hasn't seen its numbers hurt. "There's fans that left us for NYCFC, but there are people who are coming in at the same time," Warchol said. "It offsets." Those two groups were fertile ground for season-ticket sales. Then there are the casual fans, the ones who aren't "coming to every game, painting their faces and their hair," as Glick put it, but who want to experiment with soccer and might buy single-game tickets. To reach all these groups, NYCFC representatives fanned out to soccer bars across the city and organized events, gaining particular traction during the World Cup last summer. They conducted youth soccer clinics, reaching into New York's wealthy, soccer-playing suburbs. They did considerable mainstream advertising, plastering stars like Spanish forward David Villa and U.S. Men's National Team midfielder Mix Diskerud on billboards. NYCFC even gained some hard-earned visibility when a public backlash followed the news that English midfielder Frank Lampard wouldn't be joining the team to start the season, as had been announced. "We did everything from the traditional billboards in Times Square to the more dynamic, digital stuff on the ground," Pernetti said. "And there's the Yankee element as well, that brand." The Yankees, who own a minority share of the team, provided an easy launchpad for all things NYCFC, from advertising in Yankee Stadium itself to promos for the team on the YES Network and on WFAN Radio. The Yankees also had a valuable commodity to offer: their own season-ticket subscribers list. "We obviously wanted access to the Yankee fan community, and we figured we could mine some soccer fans there, and we absolutely have," Pernetti said. They believe they've drawn them in. Now they must keep them. Pernetti says to do that, NYCFC must offer something that the more established New York teams don't: a closer fan experience. "Pro sports is not as accessible as it used to be," Pernetti said. "We have a chance to create an experience where if a ball gets kicked into the stands, you can take it home. You can meet players after the game. You actually have access to what you're buying a ticket to watch." All of that begins this weekend, which couldn't come soon enough for the more than 1,600 members of the Third Rail. They've had to deal with the flak long enough. If their newborn team starts winning, they'll have the opportunity to give it back—with interest. Interesting. I hadn't heard that the Viking Army was seeing defections in any numbers. I've long felt that this is more about growing the pool of soccer fans in general rather than carving up the existing fanbase. It's also a pretty good summary of why I think NYCFC has done as well as they have: the outreach. Between the youth clinics, youth affiliates and World Cup events, they spent last summer working to build bridges to the natural soccer consituency.